Amazon is also offering $150 off 20" Intel iMac and $125 off 17" Intel iMac. $25 rebate. Specs: Built-in 10/100BASE-T ethernet, 54-Mbps AirPort Extreme wireless, and Bluetooth 2.0+EDR / Mac OS X version 10.4 Tiger, iLive '05, Mail, and more included / 1.42 GHz PowerPC G4 processor with 167 MHz system bus / One FireWire 400 port, two USB 2.0 ports, DVI output, and VGA output. Comes with 80 GB HD and works with (most) PC monitors, keyboards and mouses. 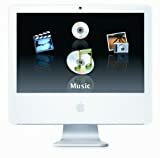 The 20" iMac G5 retails for $1699 at Apple.com, but at Amazon you can get it for $1549 with a $150 MIR. This includes Apple's recent $200 price cut plus a $150 rebate. Thanks to Cnet News.com for the info. Amazon.com offers the Apple Mac mini G4/1.25GHz Desktop bundled with the Canon PIXMA iP1600 Photo Printer for $534.98 with free shipping. (Add both items to your cart separately.) Mail-in rebates of $25 and $50 yield a total price of $459.98. Amazon has a kickass deal on the 12.1" iBook. Get it for $799 after $100 MIR. Microsoft Buys 30% Stake in Google. WTH!?! I guess if you can't beat them, buy them. Firewire and 2 USB. Price is after $100 MiR. CD-RW/DVD. One Firewire. Two USB. 54-Mbps AirPort Extreme wireless. Bluetooth 2.0+EDR. Price is after $100 MiR with Amazon. $900 after mail in rebate. In the coming days the final G4 iBook will be sold to make way for the new Intel Macs. This is our last chance to own a PowerPC-based Lappy. No Shorate of iBooks at Amazon. What does this mean for MacWorld? Amoazon Reveals Aperatures Releasae date. "This item will be released on November 30, 2005. You may order it now and we will ship it to you when it arrives." If you check out Amazons page for Apples pro-photo app, Aperture, it shows that it is due out on November 30th 2005. Hopefully this is real and not speculation as a great many people are salivating at the chance to play with this thing. Amazon are pushing out the last of the 4 Gig iPod Minis for $159, free shipping and zero tax. The deal is $10 off the $199 MSRP, plus another $30 off if you use the Amazon Visa.For $90 less than the 4 Gig Nano, that's a pretty good deal.